Add protection with YOYBUY insurance premium and receive compensation for loss or damage of goods during international delivery and protect your parcel against external factors during transit. Cost: Insurance premium costs 3% of the total price of the order. For example, if the entire order costs 500 USD, the premium will be 15 USD. Please refer to our Complaint & Return Policy to report loss, damage, or missing contents of a parcel. ● If parcel or items in the parcel are missing in transit,and you buy the parcel insurance when you submit the delivery order, we will give you corresponding compensation according to your insurance amount and compensation standard. ● If there are major physical damages to the items (such as holes in your clothes, cracked screen, etc. ),customers have the right to apply for insurance compensation. ● If the item does not work as advertised, YOYBUY will only refund you the service fee. ● If the parcel is returned to us because of delivery error, we will resend it with no additional costs. However, if it is returned to us because of refusal to comply with your country's Customs or rejection of parcel, you will be responsible for all additional costs. ● For the uninsured parcel, YOYBUY can only provide compensation for the international shipping fee. We strongly recommend you to choose insurance for your parcel. The time calculation start from the day the parcel being sent out from Yoybuy warehouse. ● Returned parcels for reasons involving your local customs will not be compensated. We have no jurisdiction over your country's customs. ● Returned parcels because you failed to pick up your parcels will not be compensated. You will be responsible for additional fees to have your packet redelivered. ● Insurance does not cover the durability of your items. 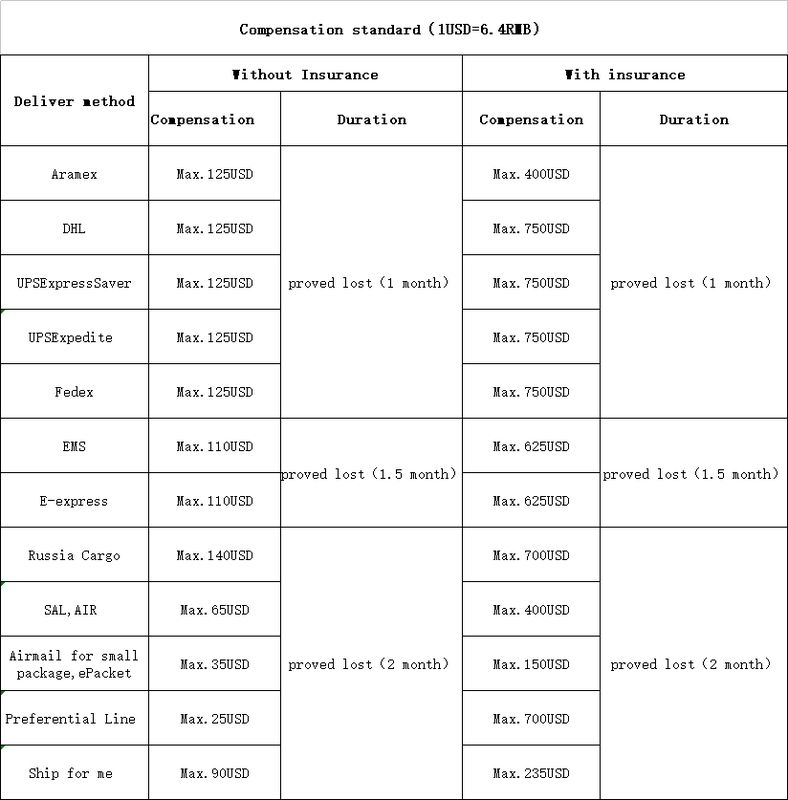 ● If items do not work as expected, insurance will cover your service fee. ● Any form of warranty, expiration dates, etc. of your items. ● Minor color differences in your product. If your product does not look as green as the green in the picture you saw, we are not responsible.